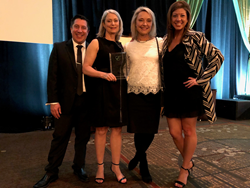 Senior Vice President of ABODA by RESIDE, Marilyn Kempter, was honored at the Washington Multi-Family Housing Association’s (WMFHA) 8th annual Emerald Awards gala which recognizes the industry’s best of the best in Washington state. Marilyn has a service component that holds a special place in the organization. Kempter received the “Volunteer of the Year Award” which honors an association member who has given their time and made an impact on the entire industry through their efforts supporting and contributing to WMFHA. Marilyn has been a WMFHA member for 15 years and helped create the association’s Community Service Committee; forming its service-based philosophy and identifying key foundations and organizations it would assist. The Washington Multi-Family Housing Association has served the following organizations in the last decade: DAWN, Childhaven, Toys for Tots, Rebuilding Together and Northwest Harvest in conjunction with Move for Hunger. After hearing the founder of Move for Hunger, Adam Lowy, speak at the Corporate Housing Providers Association conference, Kempter saw an immediate opportunity to support Seattle-based food pantry, Northwest Harvest. She initiated a partnership between Move for Hunger and Washington multi-family properties to encourage residents and guests to donate their unopened, nonperishable goods to fight hunger. The WMFHA and Move for Hunger partnership generated the donation of more than 3,000 pounds of food in its first year; approximately 2,500 meals for those in need. ABODA by RESIDE is an innovative leader in global housing management services, providing responsive, reliable and resourceful solutions to some of the biggest brands in the world, many headquartered in the Seattle area where the firm is based. For 30 years, ABODA has offered end-to-end corporate and serviced housing solutions, furnishings, property management and cleaning services. ABODA is flexible enough to meet clients’ ever-changing business needs through its award-winning customer service. Learn more about ABODA at http://www.aboda.com or call 1-888-389-0500. The Washington Multi-Family Housing Association is the Washington State chapter of the National Apartment Association. WMFHA is a collection of over 120 Property Management companies, over 1,300 Apartment Communities, representing over 200,000 apartment homes, and 220 service suppliers working together to promote and enrich the multi-family housing industry in Washington state. For more information please visit http://www.wmfha.org. Move For Hunger is a non-profit organization that mobilizes the relocation industry to fight hunger and reduce food waste. In addition to collecting food from people who are moving to new homes, Move For Hunger helps companies and individuals across the United States and Canada organize successful food drives. To date, they have collected more than 8 million pounds of food. For more information, or to find out how you can host your own food drive, visit http://www.moveforhunger.org.